Welcome to the sport. Skydiving never gets old to me. Unlike that first bite of a cheeseburger, every jump is just as exciting if not more exciting than the previous one. Stay safe and congrats on the A license. This dropzone is absolutely amazing and I can't wait to go back. I only wish they were here in Florida but it gives me a serious reason to move back to Ohio now. The DZO and staff are more then friendly with new faces and are extremely concious about safety. The DZ runway and landing areas run parallel to the Ohio river. It makes the scenery amazing. It's the only dropzone where you can make all three states in one skydive. Turn left and you're in Kentucky, turn left again and you're in West Virginia, turn left again and you're back in Ohio!!!! The local jumpers are super nice and always there to help out with visitors. There are no turbines (yet) but they do have two C-182's that are in absolute mint condition and well taken care of. They can run both plane at the same time for a larger group of fun jumpers. The packing areas are either under the tent outside or in the hanger by the lounge area. They sell GO FAST on site which is a major plus. I've been trying to get Deland to do that for a year now. LOL! The load organizing is easy and they offer rigging services as well. For being a smaller dropzone, they run just as well as Deland if not better. No chaos at this place..... just pure relaxing fun!!!!! If you live any where near South Point, OH (whether it be Kentucky or West Virginia) I would suggest you come support your local dropzone at Tri-State. A dropzone running this well at their size has the potential to expand into something even greater with the kind of DZO and people they have. Blue Skies Tri-State!!! I can't wait to come back! I'm very sorry about your loss. Blue Skies to him. nice job... stick with what your instructors say and never bite off more than you can chew. Very sorry to hear that happened. Packing Cathy is just a wonderful person. She has a great safety record and has a passion to do everthying in her power to make her fun jumpers happy. She also makes is a great experience for people doing their first tandem jump. They currently have a C-182 but will bring a larger plane in due time. Location wise is just great. You get to jump over the Georgia / Florida border and see from Amelia Island right across the Atlantic Ocean. 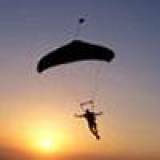 They have two landing zones which have plenty of room for all types of experienced jumpers. The larger field just north of the hanger is for the beginers and the field closest to the hanger just to the south has plenty of room for more experienced people and the swoopers. They also have packers that can get your sport rig packed in about 5-10 minutes and do it safely. As fast as the packers are, I've never had a MAL from them yet. Over all I am dedicated to help Cathy grow and I hope this review encourages others to come visit and become regulars. Welcome to the forums!!! How old are you and when do you expect to start training with your first tandem jump? Best thing you can do for that is use Woolite. Just enough to get the oil broken up. It's the only thing I know that is gentle on Nylon. I had to use it on my rig once and it worked like a champ. I wasnt' rinsing forever and it didn't hurt the material at all. Just soak the canopy in the bath tub with a couple capfulls of Woolite and gentley massage the material. I was recommended Woolite on rigs and canopies by two different master riggors in Florida. I can't imagine you can't use it on F-111 but check with your local paraloft anyway. Hope that helps. Nice people, great landing area. DZ is slowing growing but lacking facilities and a large aircraft for now.